So! My friend Ryan mentioned that I never blogged about my new couch, so I figured I would do that now. When we bought our house, we only had a couch and a loveseat. Pretty normal. Except we moved into a home with three living spaces. 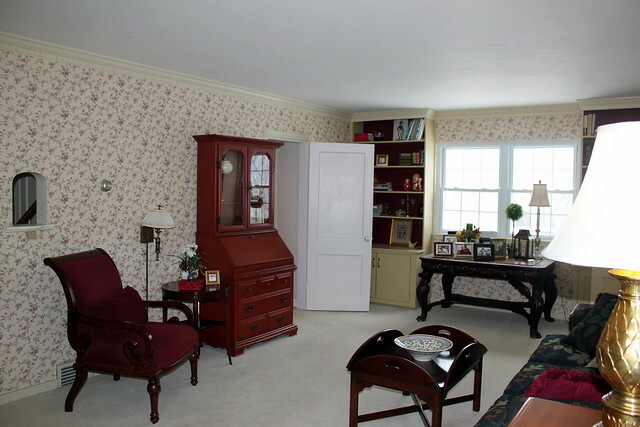 We have the gameroom downstairs, the living room and family room upstairs. Which was fine for a while, but as the living room became more and more presentable, I was itching for some furniture to put in there. 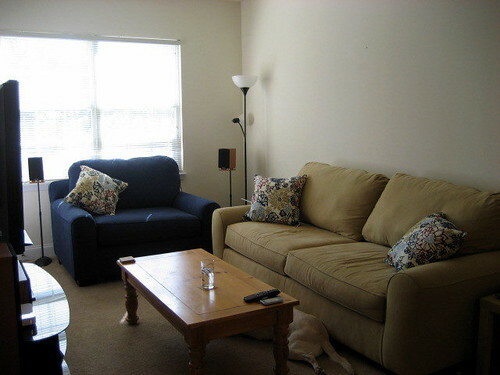 The loveseat was in there…it’s tiny, the room is huge, I wanted something else. I have been scanning craigslist every now and then for something but all craigslist couches are typically floral/plaid and hideous and I was hoping for something grey. I was also a little hesitant to buy something upholstered since you never know how people live, so I had pretty much given up. I asked Keith if he would be okay with getting it if I could arrange for a way to get it home. He said it was fine, so I instantly emailed the lady and got to work on finding a truck. Luckily, nearly all of my uncles have trucks and my sweet uncle Gino agreed to transport the couch for me. And the best part was the couch was 75$. Since we bought the exact couch, I know for a fact it cost more than 10x that. So now my little loveseat has a friennnd. 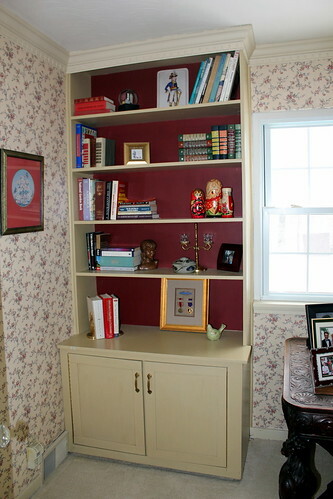 And it matches the back of my built-ins, I am so good at picking paint colors! 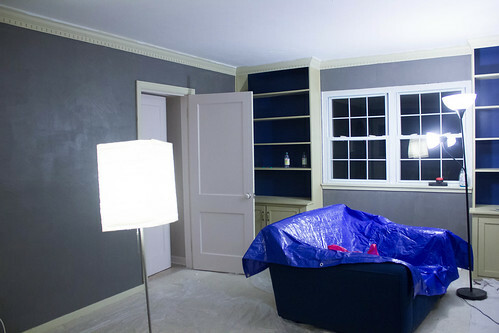 Not sure if the couches will stay where they are, they are actually currently thrown in the middle of the room since I was doing a little painting. I have plans to do some sort of painting/refinishing of the coffee table. 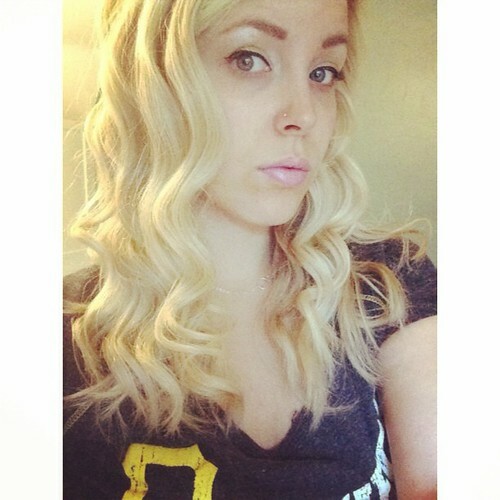 Thinking of something like the above, except probably not teal. I was doing a little trim painting the other day and decided to paint a frame. My lovely friend Megan gave me an etsy giftcard for my birthday and I purchased a print. Luckily the people we bought the house from left frames everywhere. I have at least 4-5 with weird flowers or ducks in them. But since gold is not my favorite, I repainted one! The white balance is off, but it’s a huge improvement! The print is also off-center, but I took it out and fixed it. It is currently hanging in the back hall, but I want to put it in the kitchen as soon as I get Keith to help me. And the final update is that somone is coming to fix our plumbing tomorrow! The home warranty did not cover crap. It has been completely useless. So thank the flying spaghetti monster for homeowner’s insurance. They are covering almost everything. The repairs are slated to take 3 days and they will have to dig up the basement floor, so we are spending a few days with Keith’s parents. So thankful they only live .5 mile away. I am SO EXCITED that this stupid plumbing saga is almost over! Happy 2013! I had the 1st and took the 2nd off of work and I did what any good little DIYer does and painted! 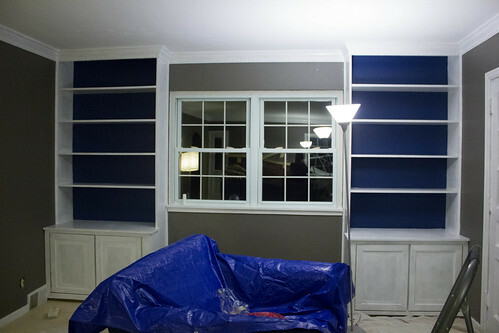 After giving my hand a rest from the last living room project, I was dying to start painting the trim. And die I did. You see, my living room has dental molding. And while it is lovely to look at, it is NOT lovely to paint. I had to go in between each tooth (I’m pretending that’s what those are called…why else is it called dental molding?) with the paintbrush. And as soon as I moved on, paint would drip out from between the teeth (this is getting weird) and I would have to go back and swipe again. Repeat times a million. I was making such slow progress I almost gave up. The problem was I was getting too much paint in there, but if I didn’t have enough paint on the brush it wouldn’t go in. And then I had a stroke of genius. 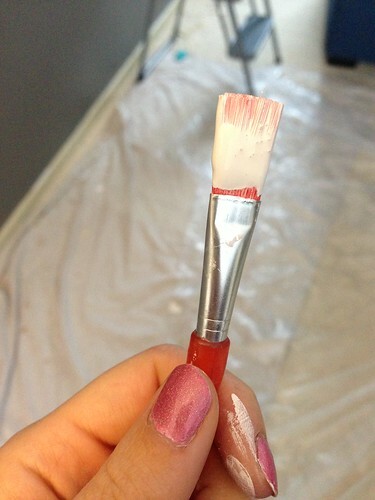 Enter the plastic craft brush. With stiff, coarse bristles, it couldn’t hold that much paint (meaning less drips), but was small enough that I could get it between the teeth. It was a lot quicker going once I started using that little guy. It still was not even remotely quick though. It’s a huge room and there is ~78 feet (?) of molding. It took me 5 hours to do all of the top trim. And while it was already starting to look SO MUCH BETTER, it kind of sucked that it took that long. 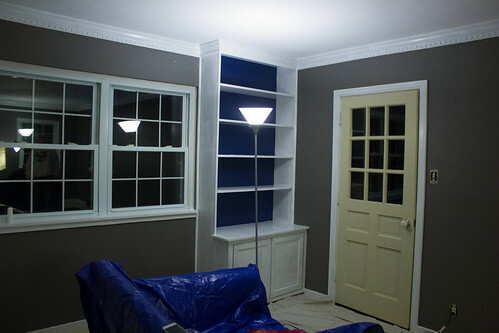 I had a little paint left so I did half of the one built-in as well. The next day was my birthday, but I was not letting that stop me. My mother-in-law offered to come help and that made it go a lot quicker. We still only got one coat of white on everything, but at least we got it on everything! Oh, did I mention my saint of a mother in law stayed and painted while Keith and I went out to dinner? This was all that was left when we got back. One ugly door, which was quickly whipped into shape. This is where we are now. 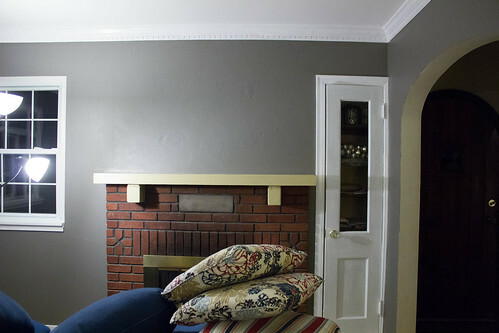 The mantle and the doorway will both be light grey. 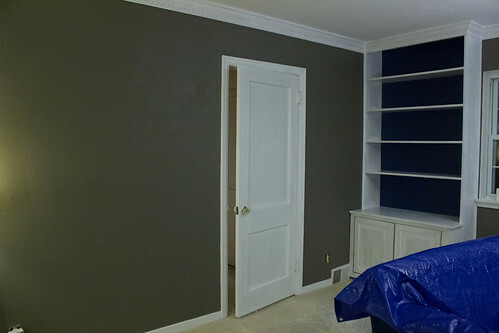 The entryway is to the right and it will also be light grey. 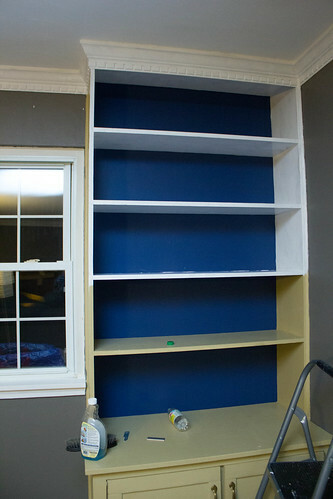 I will eventually paint the shelves inside that closet white and the backs blue to mimic the built-ins, but I didn’t want to bother with those yet. 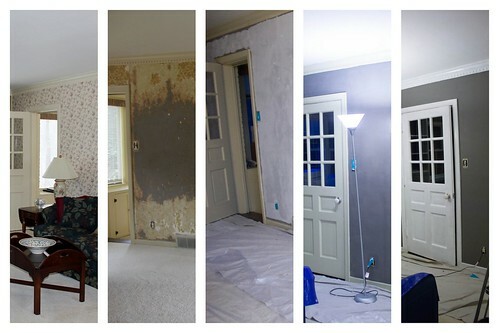 I should have done a better job with getting the same angles in pictures, but here’s a rough journey of the stages of the living room wall. 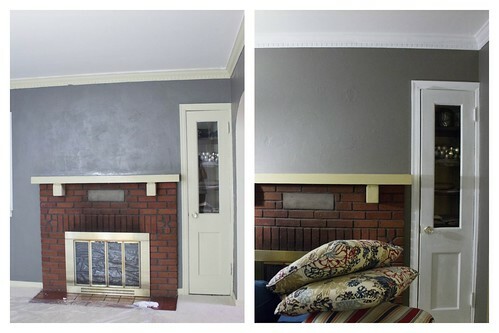 And a quick fireplace look from before/after trim. Pretty gross. 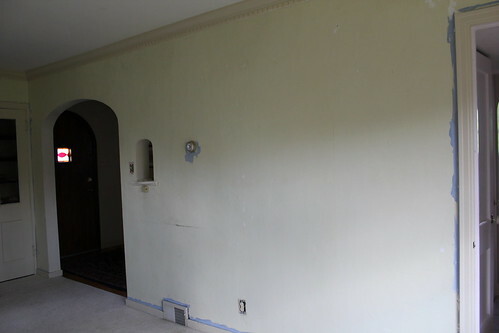 All of those white spots on the wall were where the original paint had flaked off. Friday night found me scrubbing the walls with DIF to get the last of the wallpaper glue off (that lovely brown residue). It took almost 4 hours of scrubbing to clean the wall. Again, very thankful it was ONLY that wall. Saturday, my mom arrived and we went to Lowe’s to get joint compound. First we went and filled all the random nailholes (there were dozens!) then we mixed a bunch with water to a cake-batter consistency and then rolled it on the wall. 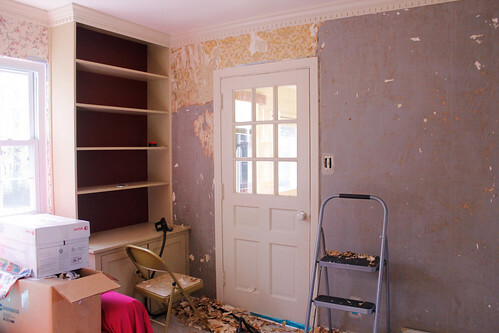 The purpose was twofold: to cover up all the dents and dings and gouges and to add some texture back into the wall so that the spots we spackled didn’t look ridiculous. Which, after living with mismatched walls for 6 months, was already a gigantic improvement! 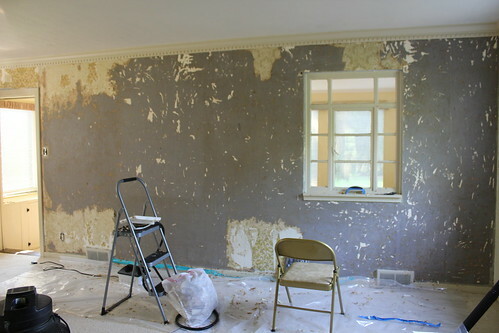 We were pretty much done for the day at that point, since we had to wait for the plaster to dry. 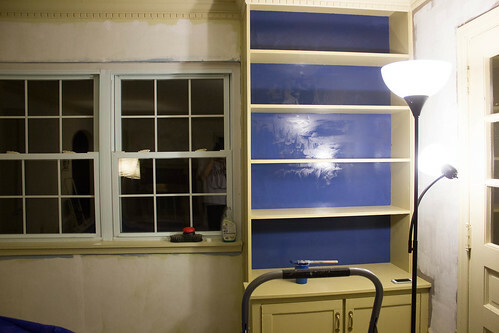 My mom left and I did the one thing I could, paint the back of the built-ins! So the back of the built-ins were red. Phew. I feel better already. Sunday my mom came up a bit later and before she got there, I painted the ceiling. I almost left it, but I am really glad I painted it because once I got started I realized how off-white it really was. My mom arrived just as I was finishing up and she started cutting in the walls. I knew the color I picked was close the the wall’s original color, but it became very clear during this step. 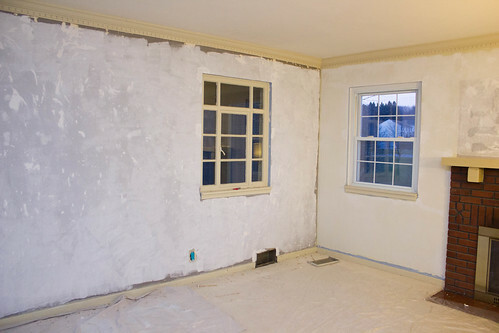 To the left is what my mom had cut in, to the right is the original wall color. Finally, a decorating decision we had in common! 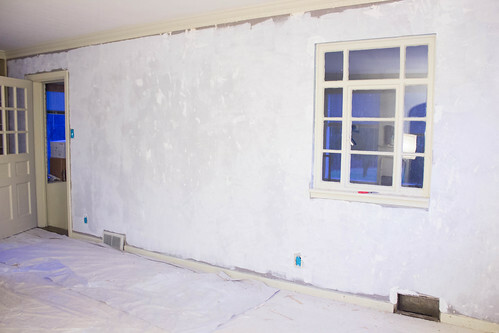 Once I finished with the ceiling, I followed behing my mom rolling what she had cut in. It still looks a little weird in there with all that cream trim. That will be gone very, very soon but I really hurt my hand from 3 days of non-stop scrubbing/painting/rolling so it will have to wait until this weekend, probably. 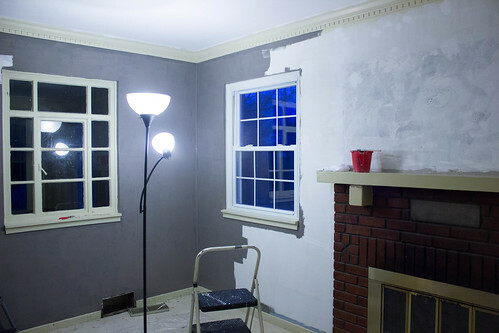 Also, it is not a brilliant idea to paint a room with no overhead lighting in December. 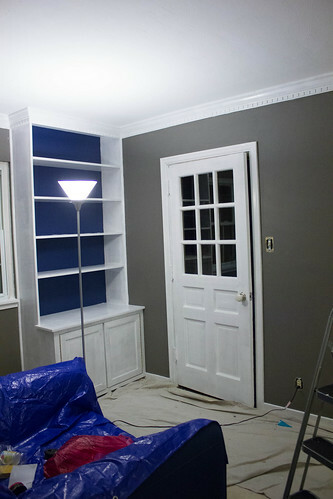 All the trim will be glossy white, the built-ins will either go light grey or white, I haven’t decided yet. 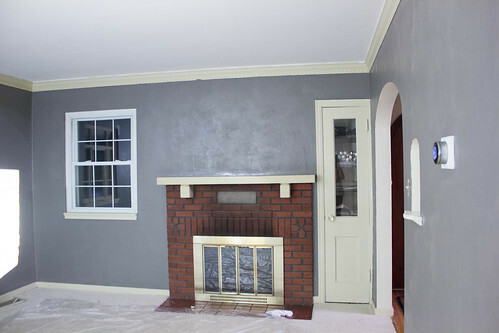 The top part of the fireplace will be light gray, Keith has convinced me to not paint the fireplace brick as I previously wanted. I might try to see if I can clean it though. 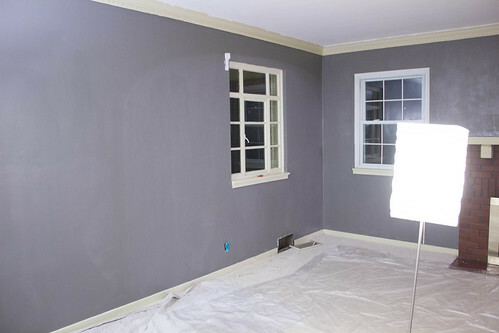 The walls may need a second coat of grey, it is too dark in the morning and too dark in the evening to actually tell, I know I missed a few spots but I am hoping I can just do some touch-ups. 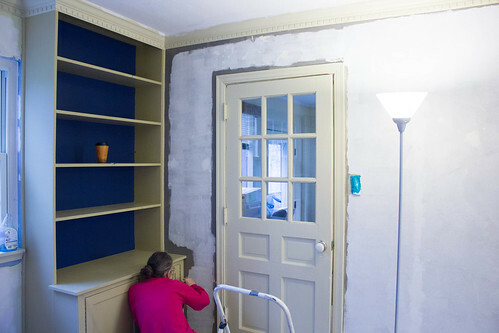 I also need to paint inside the little closet next to the fireplace, probably the same blue as the built-ins but that can be an easy weekend project. I feel like an enormous weight has been lifted being this close to completion on the living room. It was a real annoyance for me because it looked so awful for so long. The rest of my projects pretty much only involve painting. 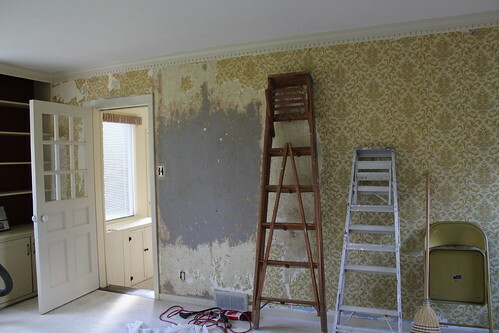 There is wallpaper in the dining room that will eventually come down, but it is only the top half of the walls and is already peeling up, so fingers crossed that is easy. So this weekend I decided to tackle more wallpaper. I hadn’t even walked into the living room since Labor Day weekend, so it was high time I got back into it. I woke up around 10ish on Saturday and walked downstairs and filled/plugged in the steamer. I ate some breakfast while the water heated and was probably in there working by 10:30. When I last left off, the wall of doom looked like this. I worked for about 4 hours on Saturday, refilling the steamer once. By the time I ran out of water the second time, Keith was almost home and so I called it quits for the day. Instead I went outside and raked for a good hour. Keith was driving the tractor around picking up leaves and then I’d rake them all away. It was sort of exhausting. excuse the blown out picture. Sooooo close! I decided I had to finish on Sunday. So I woke up this morning and got back to work. We had to leave at 2 to pick up my in-laws’ dogs, so I set a goal to be done by 1 so I could shower. I came downstairs after my shower and told Keith, “All the wallpaper is gone!! !…Except for the stuff all over the floor…” I don’t like to clean up right after I finish steaming because the wallpaper is sopping wet. So I’ll do that tomorrow-ish (maybe) once it has had a chance to dry. Next step is scrubbing down the walls to get rid of the leftover glue which will probably be a multi-day project in itself. Then I can fill the millions of holes and eventually, maybe (one day this year), I can paint! Aside from the fact that my thumb and index finger on my right hand hurt to the touch, I am soooo happy to be (sort of) done with the stupid wallpaper! 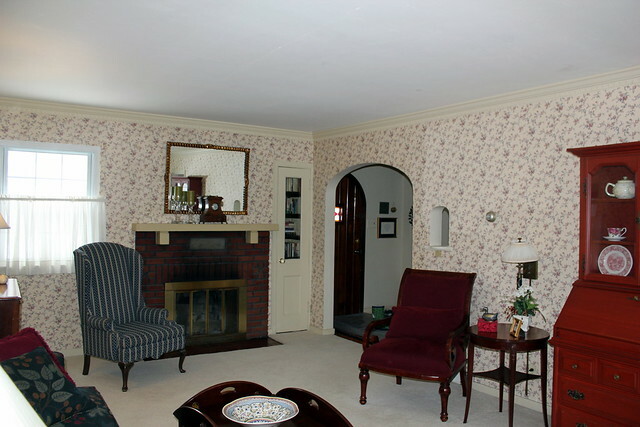 The only room left in the house with wallpaper is the dining room and it is only the upper half of the walls. 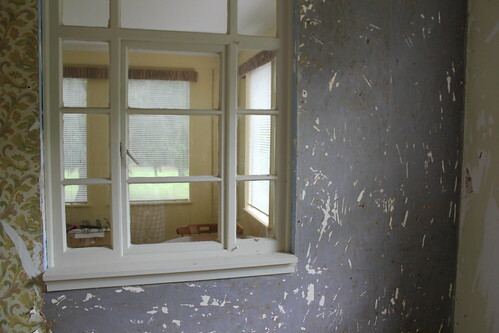 I am hoping that since the kitchen and living room were such terrors, the universe will give me a break on the dining room and it will peel off in sheets. So it’s that time of the year again. School is in session. And there goes all my free time. Actually, only of of my classes started this week, Intro to Microeconomics. I know. Snoooooooze. Thankfully it is online and will consist of 7 quizzes and 3 projects. It seems pretty straight forward so far. I had a question about the reading and my professor responded to my email within the minute, so that’s pretty reassuring. My other class, Basic Digital Photography is held at Pittsburgh Filmmakers and doesn’t start until next Thursday. I am incredibly excited, but also really dreading it because it’s 6-9 at night. Boo. 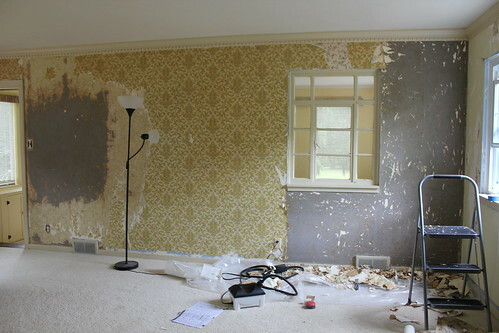 Last weekend, I asked Keith to help me with the living room wallpaper some because I knew it would be the last free weekend for a while. So the wall will have to be scrubbed down big time and patched before I can even think of painting. Sigh. 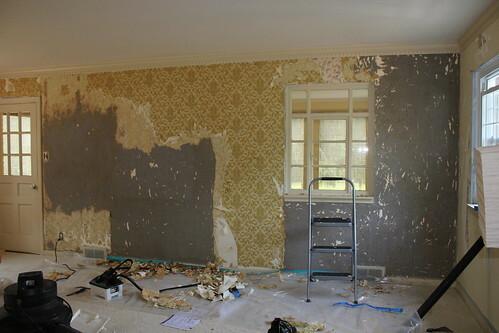 At least after this is done, there is only half a room worth of wallpaper left (the dining room). I’m also extra thankful we didn’t end up in the first house we looked at. 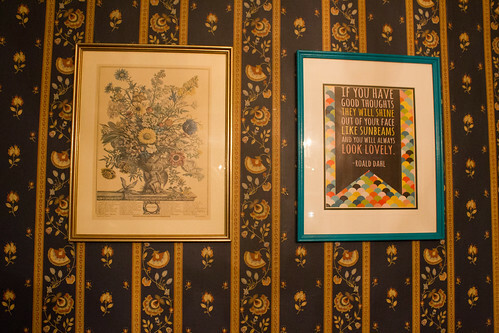 There was wallpaper in EVERY room. I would have died. This weekend Keith and I are going camping and taking Daisy! There’s a chance of rain 2/3 days that we’re going, so cross your fingers that holds off. I will hopefully have lots of pictures to share once we get back! Keith went out of town this weekend and aside from some babysitting, I had only one goal in mind: tackle the living room. The last time I touched anything in the living room was in April. My friends Ryan and Seth came over one night and attempted to help remove the wallpaper. We didn’t get very far. This was shortly after they got here (photo stolen from my mom’s camera). That yellow thing is a clothes steamer. I would steam and they would scrape. This was two hours later. At that rate, I was sure the living room was going to take weeks. Keith’s step-dad saw the time we were having and went to Lowe’s and bought us a real wallpaper steamer, but I was so over wallpaper at that point that I didn’t touch it until Friday. I sort of regret waiting so long now because it is a dream to work with! The spot on the left is what was done by three people in 2 hours (in April), the spot on the right is what I was able to do by myself in 2 hours Friday night. I spent another ~2 hours this morning and was able to get that far. It might not actually take a year! 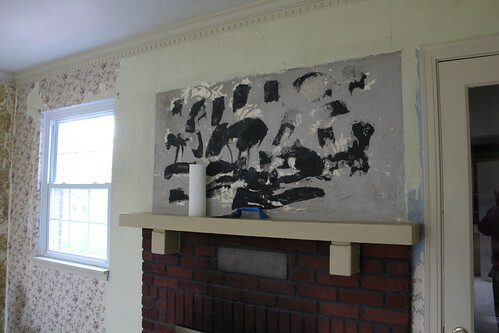 When I first found there were 5 layers of wallpaper on that wall, it was too late to just paint over it and I considered knocking down the wall just to not have to deal with it. 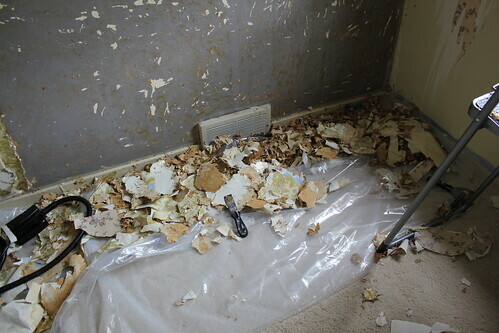 The actual wallpaper steamer and a 1″ putty knife (to scrape) really make all the difference though. And all the mess. 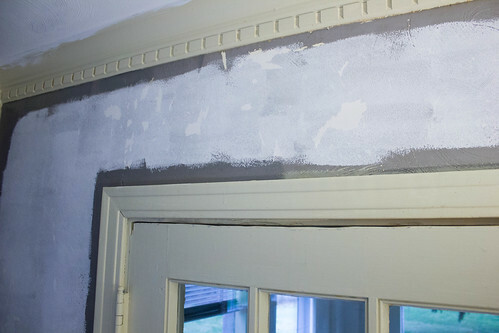 The white marks are where the grey paint came up to reveal plaster. 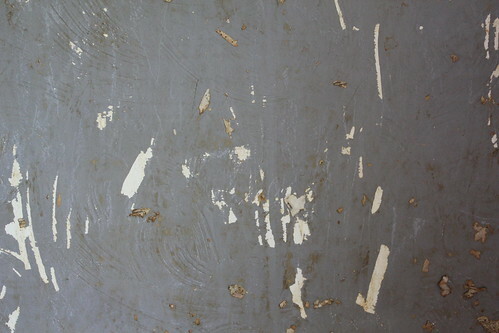 The brown = 60 year old wallpaper glue. Ugh. 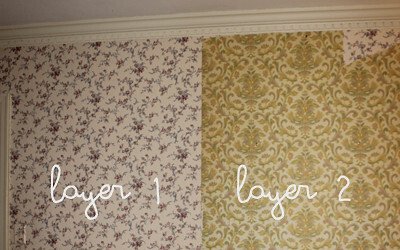 One of my more annoying discoveries was that they put all of the molding on top of the wallpaper. 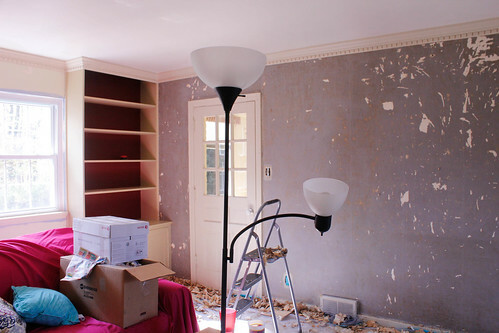 I thought that just the dental molding was on top and was trying to pry it up so I could get all the wallpaper when I found that it goes all the way up to the ceiling. 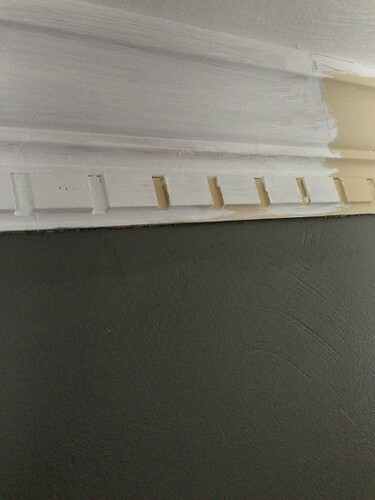 There is no way that I am removing the molding (just to put it back) so I will have to figure out some way to mask the fact that the molding is probably 4mm off the wall. I can not wait to finish this task. Luckily we don’t really use the living room but you see it when you come into the house/go upstairs/are in the dining room and it is currently so so so ugly. Luckily that’s also some motivation there. Don’t want to keep looking at that disgusting wall. I will conquer you yet, wallpaper. 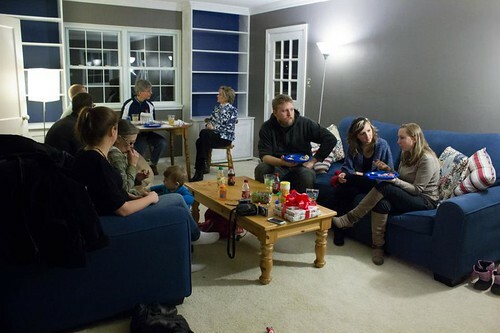 The living room was one of my favorite things about the house from the very beginning. It is huge (23×16, I think), it has a fireplace, it has great dental molding, and it has two awesome built-ins. The living room is to the right when you walk in the front door. This is from that doorway. 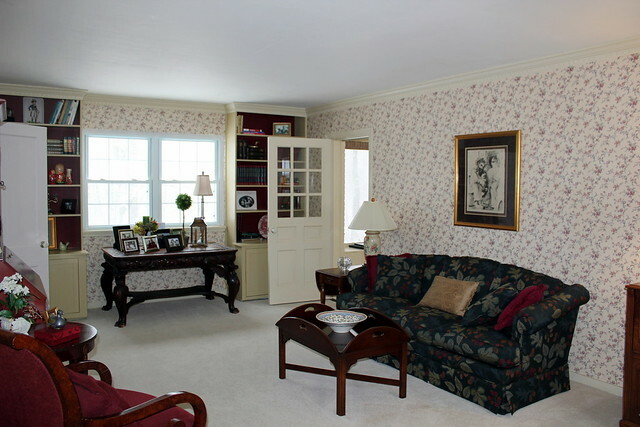 The open door on the right leads to the family room. 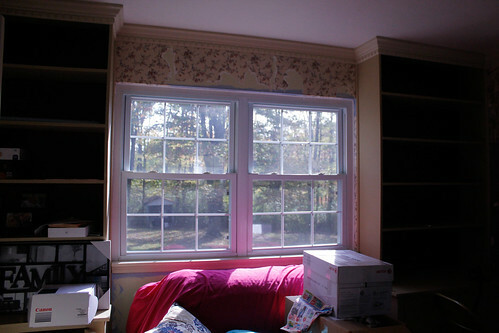 See my pretty built-ins! 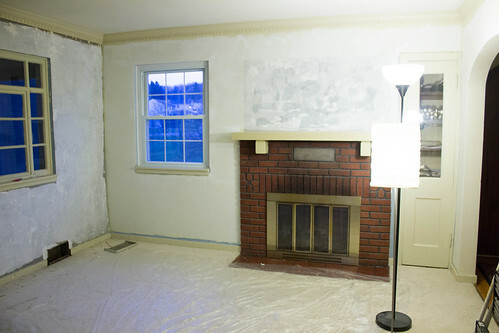 This is looking back to the entry way with my (working) fireplace! Also a cute little closet that they kept books in. That open door leads to the hallway that leads to the kitchen. 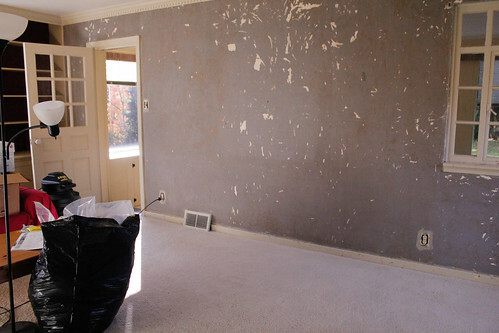 Now the living room doesn’t need a lot done, just remove the wallpaper and paint. 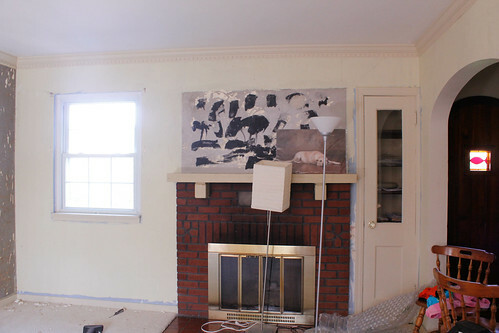 Oh and we want to replace the fireplace inset because it is manual and that scares me and it is ugly. And I have visions of building a window seat between the built-ins. 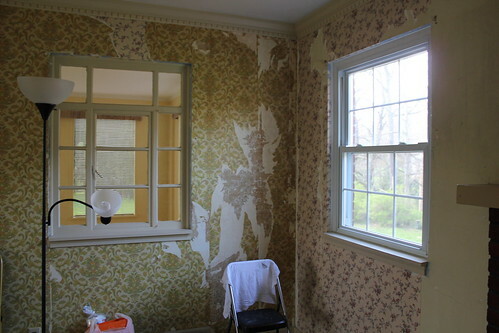 So while waiting for some kitchen paint to dry, I decided to find out what was under that lovely flowered wallpaper. 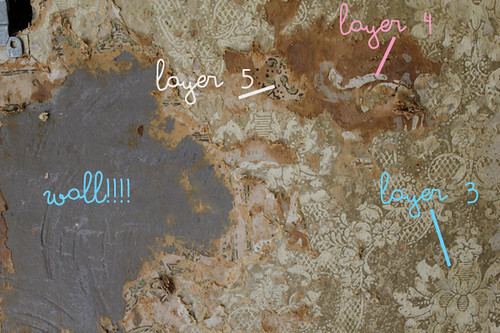 There are 5 layers of wallpaper. Layer 3 is this gold metallic super thick wallpaper. It has some sort of thick almost-cork/cardboard/wood backing to it. It is bizarre. And horrible. More good news: it is only on this wall. The other three walls only have the flowery layer 1 on them. More bad news: it took my mom and I over an hour to clear that spot which was maybe 8 inches across? Don’t even ask what that black stuff is or what I’m going to do about it. 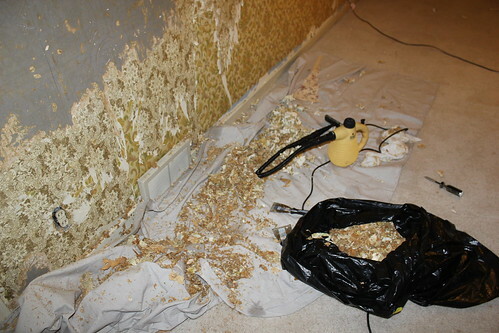 And this was a small portion of the mess the 5-layer wall made. The wallpaper felt like wet, crumbled leaves since the only way it would come down was with liberal steam and even then it would only flake off. I foresee this taking weeks to reach plaster. Luckily we have a game room which holds the tv and hopefully the couch, so this room will be empty until we buy more furniture.